A quick glance at the map will reveal that Swaziland has no coastline. No matter. Business billionaire Moses Motsa, the project leader, intends to dig a 26 km long canal from the Indian Ocean south of Maputo, west across Mozambique to the town of Mlawula, in Swaziland’s northeast corner. There a harbour big enough to berth four ships at a time will be built on 15 to 20 hectares of land at a cost of R30 billion. The trouble is that the nearest Swaziland gets to the sea is over 70 km as the crow flies, as Mozambique’s national news agency AIM quickly pointed out, not 26 km. The project was also ‘entirely unnecessary’, the agency added, as Swaziland’s main trading partner is South Africa, which provides some 90% of Swaziland’s imports and buys about 70% of its exports. ‘The rest of Swaziland's trade, for example with Europe or the US, can be easily handled by the port of Maputo. There are already reasonable rail and road links between Swaziland and Maputo. Upgrading these would certainly be much cheaper than building an inland port,’ further read the agency’s report. It added that the Mozambican government did not seem to have been consulted on the possibility of a canal going through its territory. This quite literally outlandish project was not announced on 1 April so we must presume Motsa and the government are being serious. 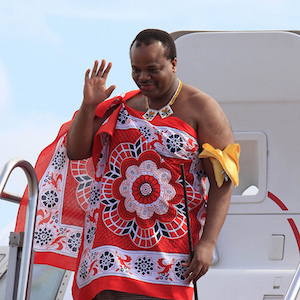 Last year the Swazi monarch opened the King Mswati III International Airport, a superfluous US$250 million construction, since the only commercial airline that uses it is Swaziland Airlink for its flights to South Africa. The company was quite happy using the old airport. But Swaziland’s current intention to build a seaport raises Mswati’s ambition from the merely extravagant to the totally absurd. It recalls the late Malawian President Bingu wa Mutharika, who, in 2010 actually got as far as building a harbour at Nsanje on the Shire River. The plan of this R42 billion project was to send ships and barges down the Shire to its confluence with the mighty Zambezi and then, via Chinde, at the mouth of that river, to the port at Quelimane, about 150 km up the coast. He even presided over a ceremonial inauguration, to which all regional leaders were invited. Only Zimbabwean President Robert Mugabe and Zambian President Rupiah Banda arrived to triumphantly greet the first two barges carrying fertiliser. But, like Mswati, Mutharika hadn’t consulted the Mozambique government, which blocked the barges and effectively scuppered the whole project, saying the rivers weren’t navigable and no environmental impact assessment had been done. In the same vein – though perhaps more rationally – Zimbabwe’s Minister of Transport and Infrastructure Development, Obert Mpofu, was recently quoted in the local press as saying his government was negotiating a multi-billion dollar connection to a new seaport north of Beira. Again the government seemed to be going full-steam ahead before discussing the project with Mozambique. Mswati, Mutharika and Mugabe are of course not alone among leaders of landlocked countries in suffering from what might be called Masefieldian Sea Fever (‘I must go down to the seas again, to the lonely sea and the sky’ as the poet John Masefield famously yearned) – even if their symptoms may be more extreme. The International Court of Justice is currently hearing a case in which Bolivia is demanding a strip of land from its neighbour Chile that would re-connect it to the Pacific Ocean. Despite being landlocked, Bolivia has maintained a navy on Lake Titicaca since it lost 400 km of coastline 136 years ago when Chile invaded it. Being landlocked obviously carries serious disadvantages and these may be considered as yet another of the negative legacies of colonial boundary-drawing for Africa especially. This continent – with the recent addition of South Sudan – has 16 nations with no coasts, a much higher proportion (around 29%) than any other region in the world. And so Uganda, for instance, is presently quarrelling with Kenya about the route that should be followed by a pipeline it plans to build through its neighbour’s territory to pump its newly discovered crude oil to the Indian Ocean. Chad experienced similar problems in pumping its crude oil through Cameroon to the Atlantic. Being landlocked makes a country dependent on the goodwill of the neighbours that stand between itself and the ocean. In the Southern African Development Community (SADC) that is especially so as the proportion of landlocked states is even higher (at 40%) than for Africa as a whole. Regional economic integration ought in theory to erase the disadvantages of being landlocked. As a member of the Southern African Customs Union, Swaziland especially, suffers no hindrance or premiums in importing and exporting through Durban. Malawi and Zimbabwe are members of SADC free trade area and so also enjoy largely free passage to and from the sea for their products. None of these countries is trading in volumes that are likely to overload the ports of their seafaring neighbours. So it’s hard to see what difference having more direct access to the sea would make. In his benchmark book on African state formation, States and Power in Africa, Jeffrey Herbst has suggested that the people of Swaziland and Lesotho, for instance, would both benefit from much greater integration with South Africa, even to the point of total absorption into their big neighbour. Yet the likes of Mswati and Mutharika go to crazy lengths in the opposite direction, even trying to transform their landlocked countries into maritime nations, to be more sovereign than they are, not less. It does not give one much hope for greater regional integration. Geography is no doubt an important cause of success or failure of states. But it is not destiny, as Daron Acemoglu and James Robinson argue in Why Nations Fail. It is the strength and quality of institutions – and what governments make of their geography – that is decisive. Swaziland’s quest for maritime power says much more about the country’s system of government than about the country’s landlocked status. Witness the great success of another landlocked country, Switzerland.